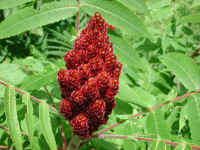 (Sumac, Staghorn (Rhus typhina) - 01) Staghorn sumac is a small deciduous tree that can grow to heights of 10 meters (30+ feet). 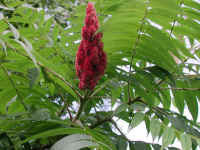 It is a member of the Anacardiaceae or Cashew family, and is a native to eastern North America. 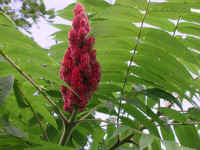 The staghorn sumac can be found growing naturally from the Ontario and Quebec provinces of Canada south to northern Georgia and Mississippi in the United States. 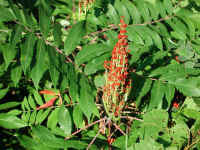 (Sumac, Staghorn (Rhus typhina) - 01a) The pinnately compound leaves of the staghorn sumac grow alternately along the branches. 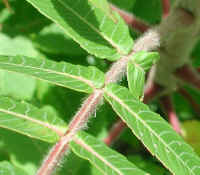 The serrated leaflets grow opposite one another. 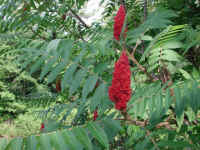 The most identifiable feature of the staghorn sumac is its bright red conical blooms of densely packed red drupes that grow from the terminal ends of the branches. 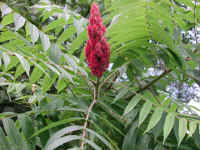 (Sumac, Staghorn (Rhus typhina) - 01b) The pinnately compound leaves of the staghorn sumac grow to lengths of from 25 to 55 cm (10 to 20 inches) long, that can each have from 9 to as many as 31 serrated leaflets. The leaf growing to the left of the bloom appears to have 21 leaflets. 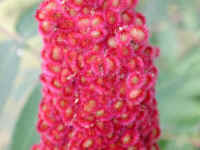 (Sumac, Staghorn (Rhus typhina) - 02) This is another look at the conical bloom and fuzzy red fruit of the staghorn sumac. (Sumac, Staghorn (Rhus typhina) - 02a) In this photo, we have a closer look at some of the staghorn sumac flowers and fuzzy red fruit, and the serrated edges (margins) of the leaflets. 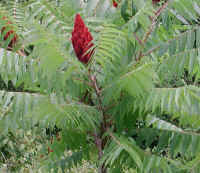 The branches and leaf petioles (stems) are covered with rust colored hairs, which help identify the staghorn sumac when it is not in bloom. We also seem to have caught a picture of a baby inch worm crawling on the leaf petiole (bottom center of the photo). 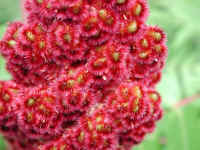 (Sumac, Staghorn (Rhus typhina) - 03) This is another look at the tightly clustered fuzzy red fruit that form the comical drupe of the staghorn sumac. 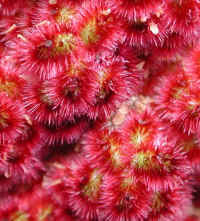 (Sumac, Staghorn (Rhus typhina) - 03a) This is a close up look at some of the staghorn sumac fuzzy red fruit. 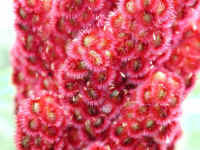 (Sumac, Staghorn (Rhus typhina) - 04) This is another close up look at the bloom and developing fruit of the staghorn sumac. (Sumac, Staghorn (Rhus typhina) - 04a) In this close up photo we have a look at the greenish white flowers and the developing fuzzy red fruit of the staghorn sumac. 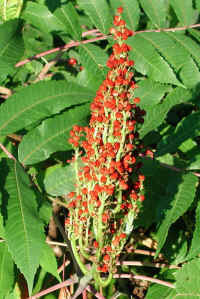 (Sumac, Staghorn (Rhus typhina) - 05) This staghorn sumac conical bloom has only sparse fruit, which allows us to better see the structure of the tightly clustered upright drupes. (Sumac, Staghorn (Rhus typhina) - 05a) This is a closer look at the cluster of upright drupes of the staghorn sumac from the previous photo. 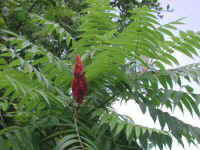 (Sumac, Staghorn (Rhus typhina) - 06) Since staghorn sumac usually grow in thick groves, it is often hard to distinguish the shape of a single tree. In this photo, we are looking at the top of a single staghorn sumac tree. The darker main trunk continues to grow 'straight' up, but the single side branch continues to split, producing 'multi-crowned' top. (Sumac, Staghorn (Rhus typhina) - 06a) Below the crown of fruit on this staghorn sumac, we can see that the compound leaves grow alternately from the trunk or branch. 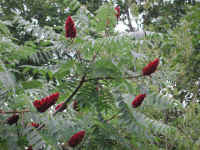 (Sumac, Staghorn (Rhus typhina) - 07) We have seen some references to the fact that the fruit and leaflets of the staghorn sumac was mixed with tobacco and other herbs, and was smokes by Native Americans; however, since smoking is hazardous to our health, we don't recommend that anyone try it. 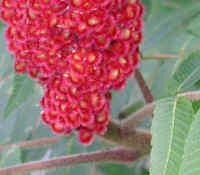 (Sumac, Staghorn (Rhus typhina) - 07a) This is an excellent example of the staghorn sumac fruit. 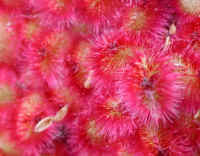 We can clearly see the red fuzzy densely packed drupes that form the conical cluster of fruit. 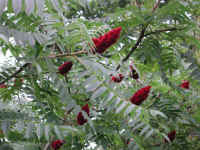 (Sumac, Staghorn (Rhus typhina) - 08) This is a closer look at some of the fruit of the staghorn sumac. 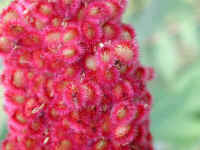 We have heard of people collecting the ripe fruit of the staghorn sumac to make pink lemonade. To do this the fruit is soaked and washed in cold water, and then strained and sweetened. We have never tried to do this, so we can't report on the results. 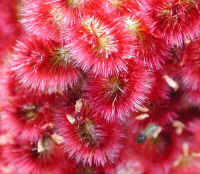 (Sumac, Staghorn (Rhus typhina) - 08a) This is an even closer look at some of the red fuzzy fruit of the staghorn sumac. 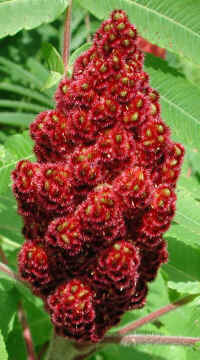 (Sumac, Staghorn (Rhus typhina) - 09) This is a closer look at fruit and flowers of the staghorn sumac. In response to our previous comment about making pink lemonade from the fruit, Peter Tiziani wrote, "After hearing about sumac tea for years, I tried it last year, and highly recommend it. Rather than soaking the berries in cold water, I bring it to a boil to "pasteurize" it. Although the raw berries have little aroma, when you bring them to a boil they release a wonderful fragrance that's unlike anything else I know of. The tea comes out a beautiful rose color, and it's quite tart. Taste wise, it's similar to both ice tea and lemonade, but with an additional "fruity" component. I consider it to be superior to iced tea in both flavor and appearance. Sometimes I make the tea concentrated (at which time it's a beautiful ruby color) and add it to other drinks, as it creates a "new" tropical fruit flavor that's surprisingly good. It's unfortunate that sumac tea has never become a regular part of American culture, because it's both incredibly abundant and it makes a wonderful summer drink." (Sumac, Staghorn (Rhus typhina) - 09a) This is an even closer look at some of the staghorn sumac's flowers and fruit. When we asked Pete about how he makes his tea, and whether or not he picks off the fruit, he responded: " I made some last night, and it didn't seem quite as tart as the stuff I made last year (though definitely still good). I read however, that the seed heads produce more and more malic acid (the same acid that makes apples tart) as they ripen, so they should continue to improve as we continue towards the end of summer. That malic acid is water soluble however, so the flavor eventually washes away with the fall rains. I picked the berries off the seed heads the first time I made it, but now I just drop the seed heads in whole. The woody stem doesn't seem to affect the taste any. After I boil it for a few minutes, I cut the heat and let it sit a bit. Then I dish out the seed heads and filter the "tea" through a coffee filter. 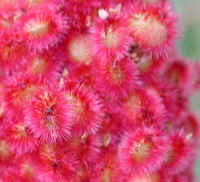 You'll probably be surprised by both the tartness and the beautiful color. Have fun with it! (Sumac, Staghorn (Rhus typhina) - 09b) This is another close up look at the fruit and withering flowers of the staghorn sumac. 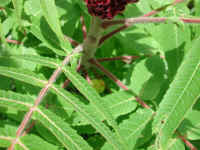 (Sumac, Staghorn (Rhus typhina) - 10) In this photo, we can see the hairy leaf stems of the staghorn sumac. 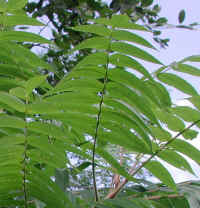 The hairs on the branch below the fruit cluster is not as evident in the shadows. (Sumac, Staghorn (Rhus typhina) - 10a) This is a closer look at the hairy leaf stems of the staghorn sumac. (Sumac, Staghorn (Rhus typhina) - 11) In this photo of staghorn sumac, we can see that each fruit cluster is at the terminal end of separate branches. (Sumac, Staghorn (Rhus typhina) - 12) In this photo, we are focusing in on one of the upright cluster of drupes at the end of a staghorn sumac branch. 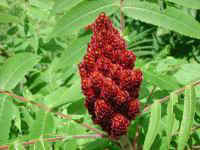 (Sumac, Staghorn (Rhus typhina) - 13) This is another look at a staghorn sumac with its upright cluster of fruit. (Sumac, Staghorn (Rhus typhina) - 13a) In this photo, we are looking up at the underside of a staghorn sumac leaf with its 21 leaflets. 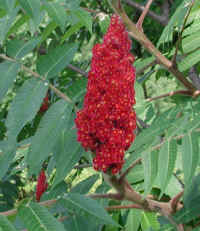 (Sumac, Staghorn (Rhus typhina) - 14) This is another view of a cluster of fruit on a staghorn sumac. 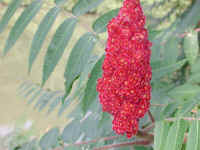 (Sumac, Staghorn (Rhus typhina) - 15) This is another look at the fruit on a staghorn sumac. 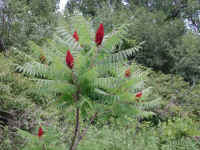 (Sumac, Staghorn (Rhus typhina) - 16) In this photo, we're looking at a section of a small grove of staghorn sumac.